Remember the grimaces and frowns over health food that mother served us when we were small.. silently resolving all the time, that we will never make dull rustic food like this ever in our lives, and the irony of it is, we do! We make it. Coz we are older, umm… wiser and usually because our ‘been there done that’ taste buds have come back home 🙂 We somehow find warmth, joy and taste in that bowl of porridge. I never thought I would. But now I eat my own words, savor the austere roti and lick that delicious hot bowl of goodness too. 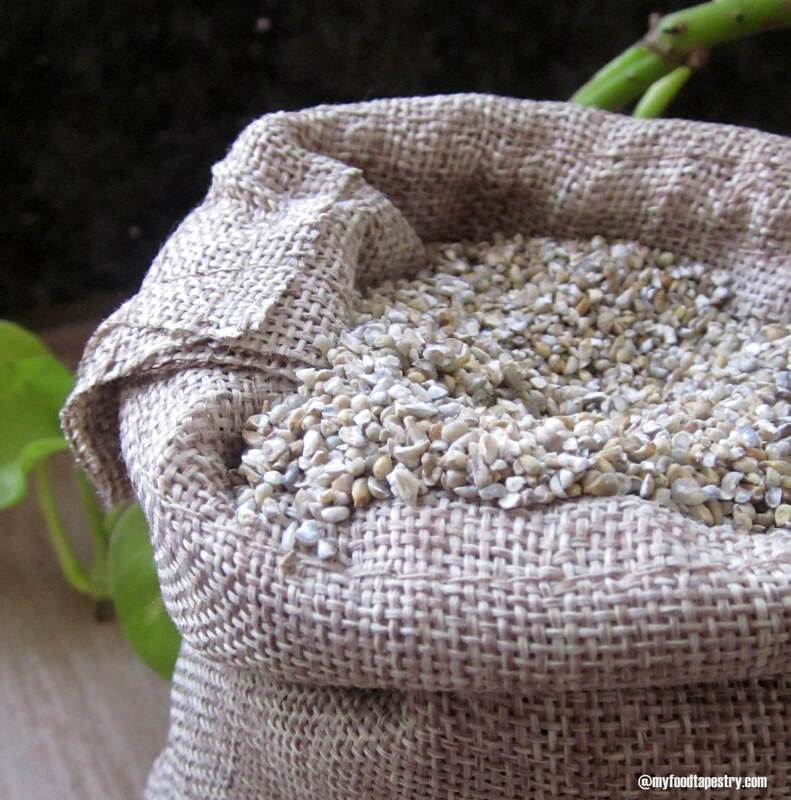 Bajra or pearl millet is one of the oldest and most popular kind of millet. It is a gluten free grain with phenomenal nutritional benefits. Eating bajra provides us with disease fighting phytochemicals that lower cholesterol, antioxidants, plenty of fibre, folate, magnesium, copper, zinc, vitamins-E and B-complex, thiamine, riboflavin and niacin. It is particularly noted for its high iron content. Being rich in fiber, it maintains your glucose levels hence excellent for diabetics. 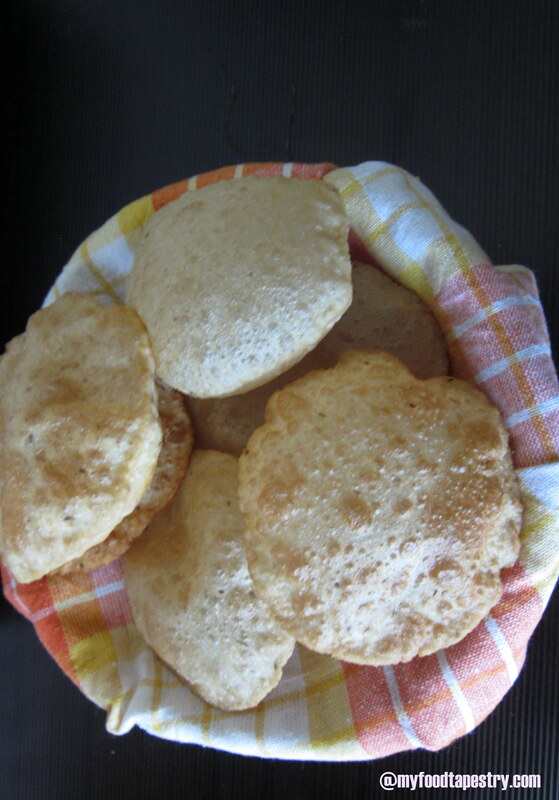 I have two very traditional North Indian delicacies made from pearl millet. 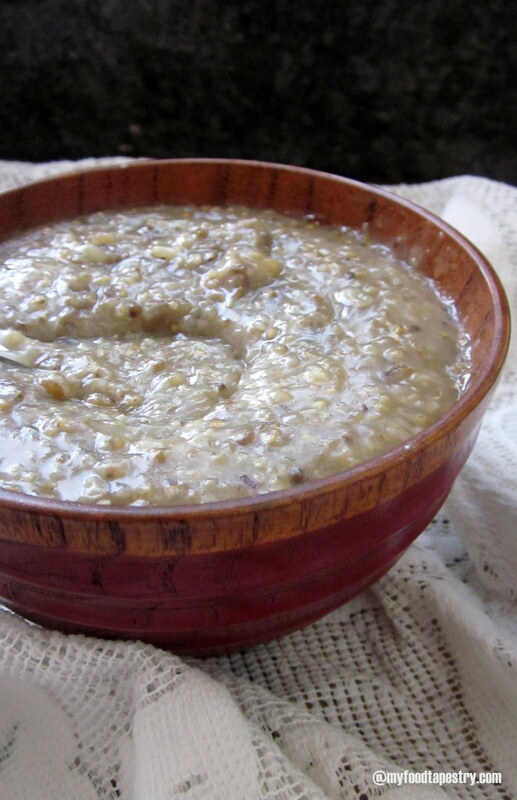 A humble bowl of porridge ideal for breakfast or brunches and the very bucolic slightly thick nutty rotis made with its flour. I have used the broken version of pearl millet, easily available in Indian stores. 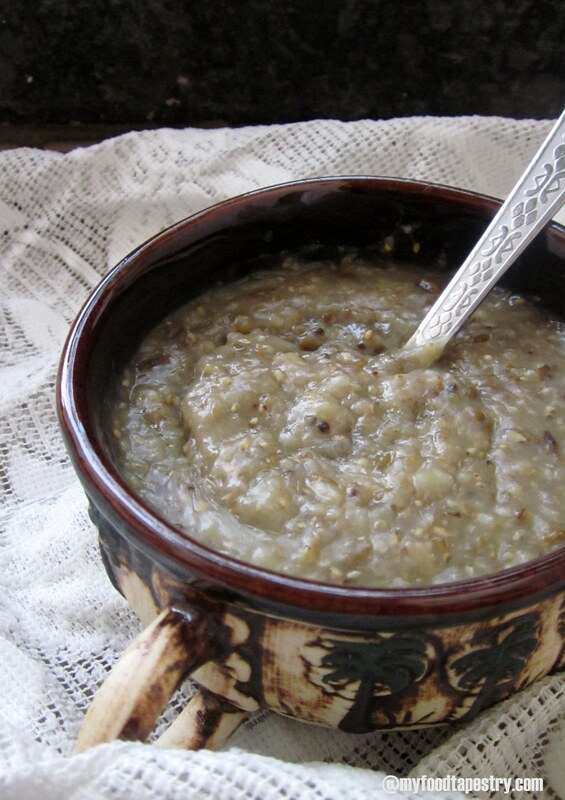 Bajra is typical winter food, generally/mostly extensively consumed when the weather is cold. 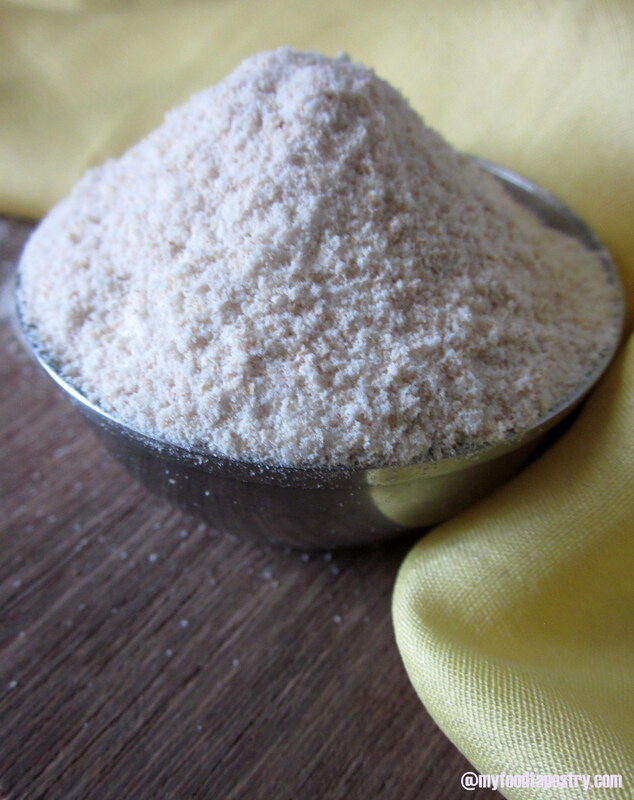 According to Ayurveda, bajra when eaten with jaggery and ghee becomes more enriched with calcium and iron. Wow, isn’t it. 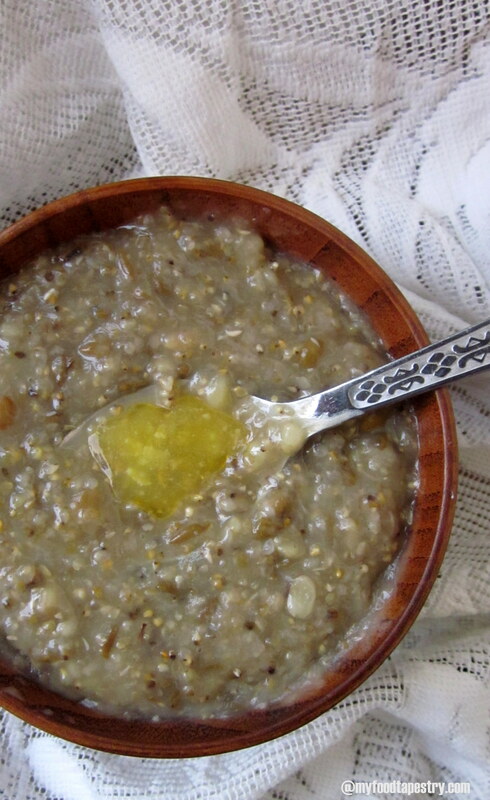 Ghaat, khichri, thuli, dalia, kheech are the various names for porridge in India. Multiple communities, multiple names! 🙂 But the aroma, one. The taste, one. Method? a tad different here and there… but the soul, the essence is the same. 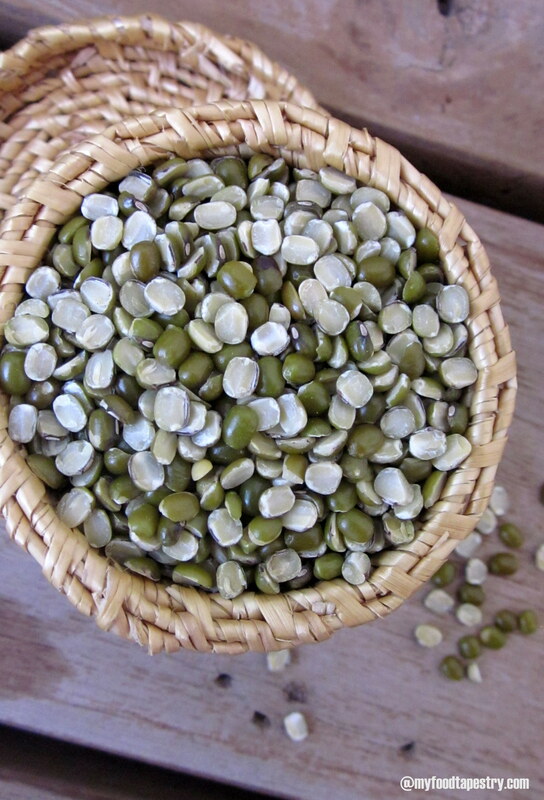 Wash and soak the split green mung dal for at least 30 minutes. 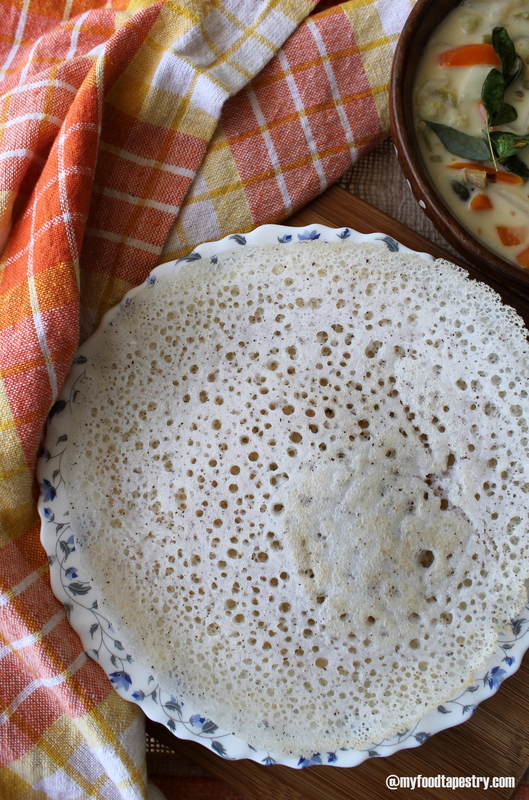 In a deep heavy pot or pressure cooker, heat the ghee, dry roast broken pearl millet for 3-4 minutes. Then throw in the dal without the water. Roast the dal and bajra for another 2 minutes. To this, add 5-6 cups of boiling water. Season with salt. Keep mixing, else you will find knots and lumps in the final product. Keep stirring till you get a homogenous mix. Now at this stage pressure cook the contents for 7-8 whistles. Once done, cool. Remove. Give a good final stir. 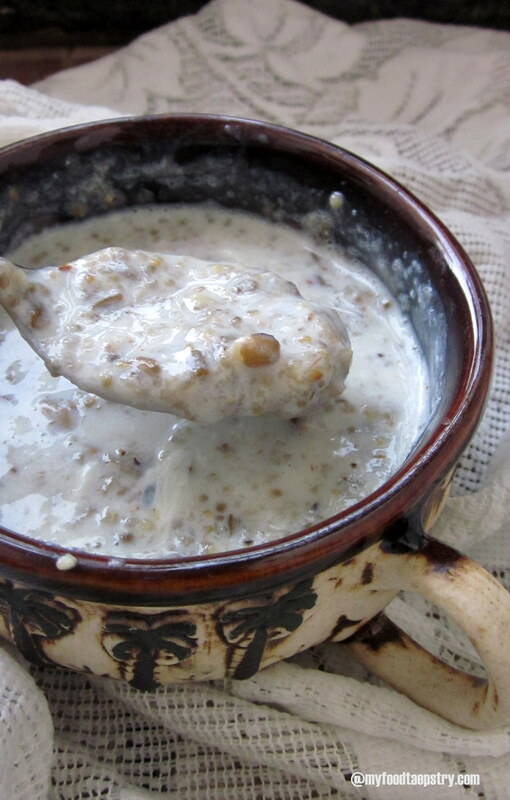 Enjoy the porridge with ghee or curds or milk or kadhi. My fav combination – with milk! 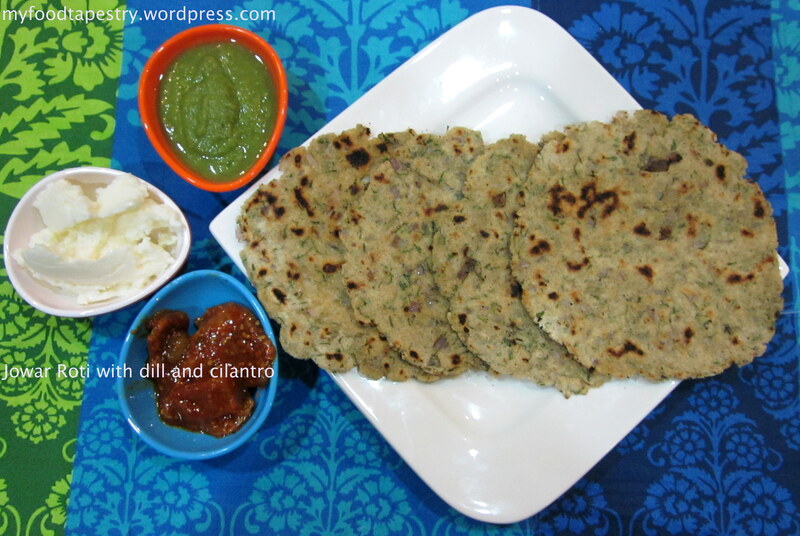 To make this wonderful rustic flatbread you need pearl millet flour. 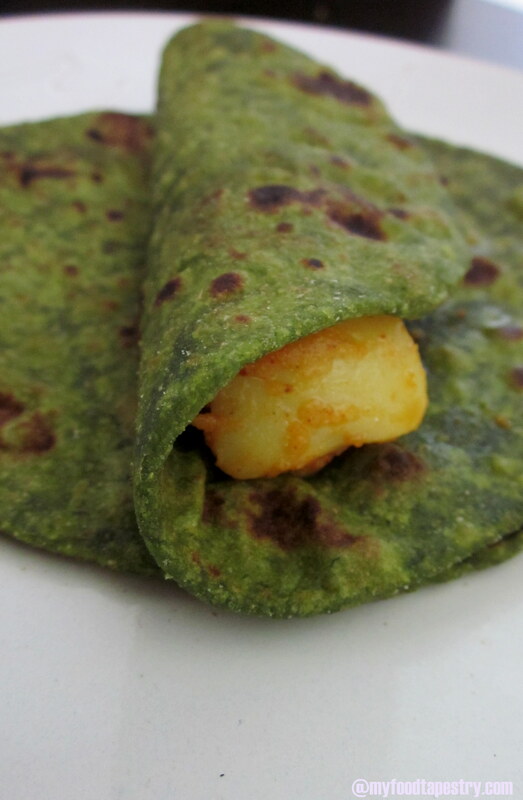 Although absolutely simple to make, these rotis are delicious! I love to eat them with fresh white butter and jaggery! Gud and makkhan take this humble roti to another level! Using hot water, bind the dough to a soft texture. Knead well for 2-3 minutes. 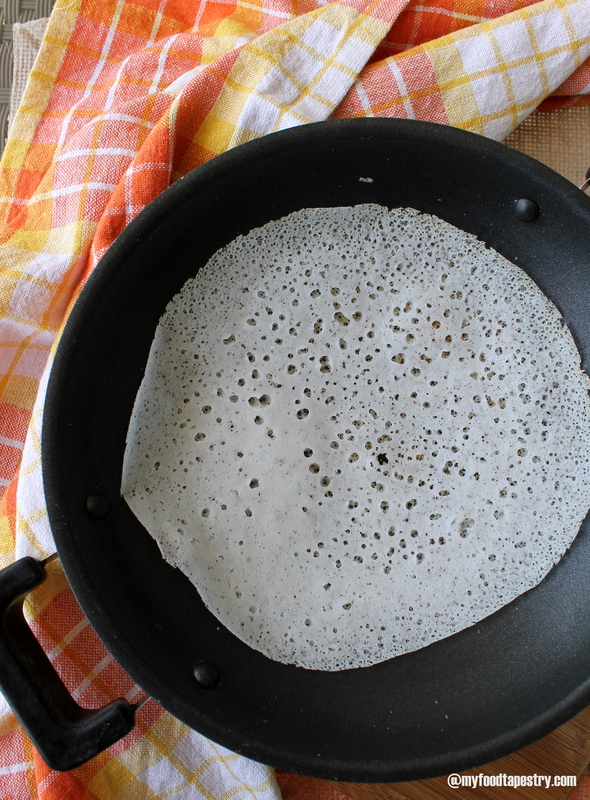 As is the case with all millet rotis, you need not wait to make the flatbread. The dough should be used immediately to make the rotis. Grabbing a handful of the dough, roll out into a thin roti. 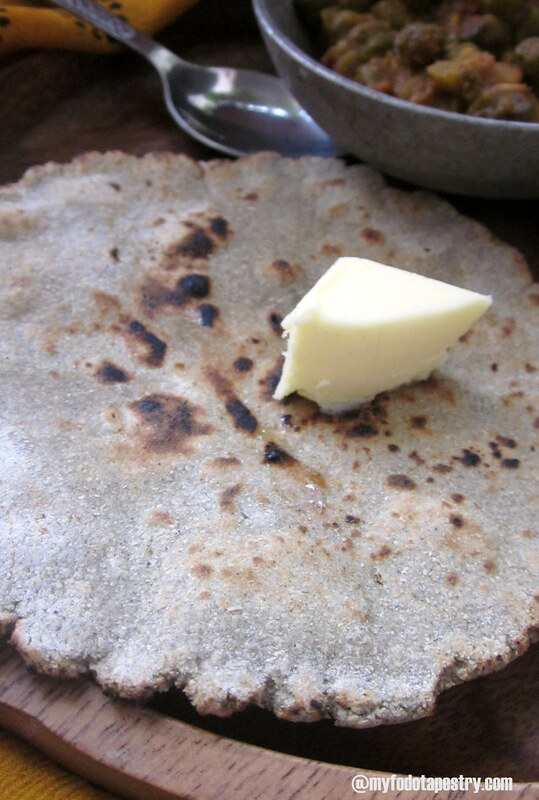 Generously dust the rotis with dry bajra flour or wheat flour to make the rolling easier. 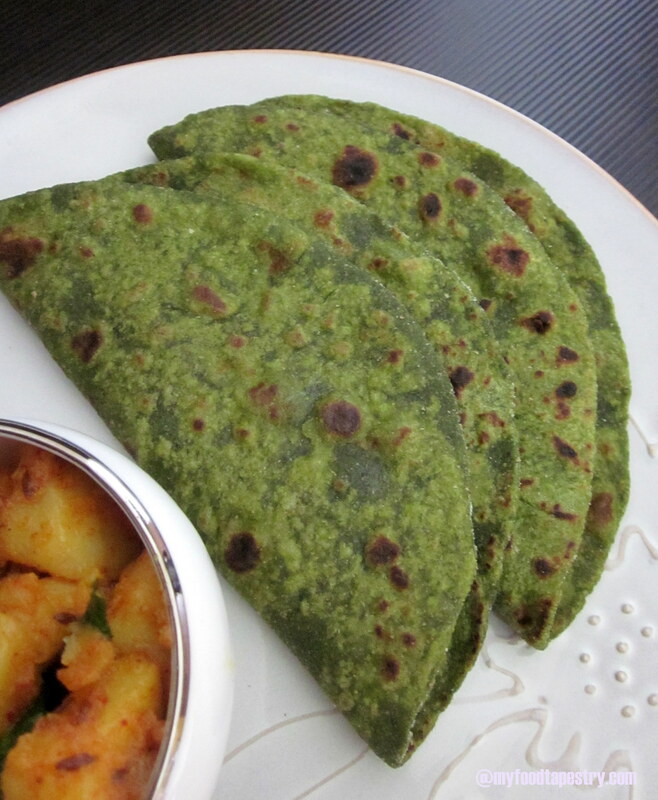 Cook the rotis on a hot tava (griddle) till both sides are light brown in colour. Brush one side of the roti with melted ghee and serve hot. 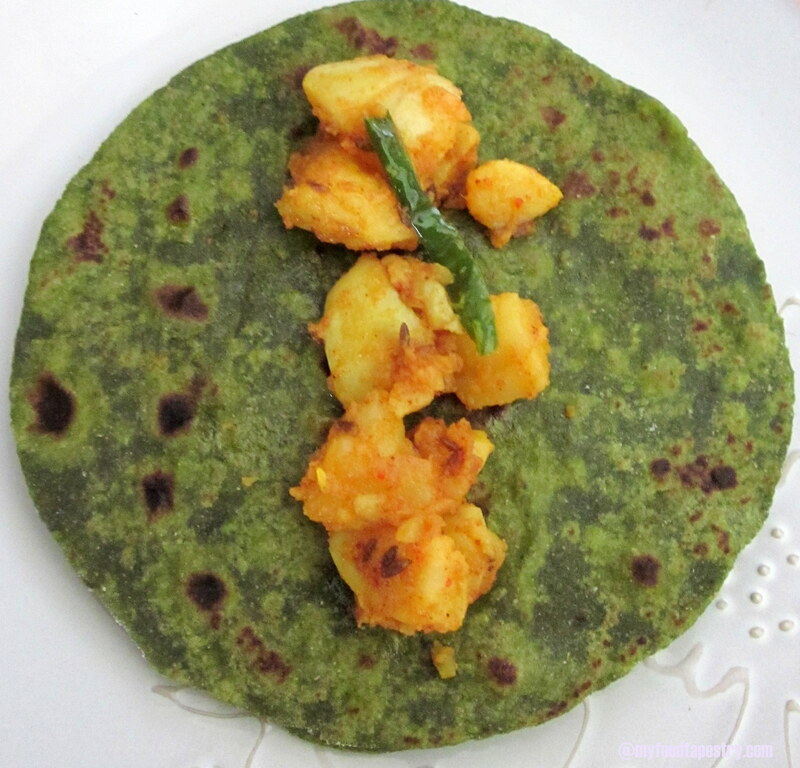 These delicious rotis can be served with any curry, some onions and green chilies. A simple wholesome meal for thousands of people in India. I find my 6-year-old cringing or making faces when porridge is served and I do not fret. Having been in her shoes, lived the part of a fussy persnickety child… I simply cajole her, sometimes bribe, sometimes bargain and just sometimes let it go. As I know she will come back. In Sometime. You don’t really appreciate something unless it makes its presence felt in a loud clamoring manner. Color was never that important to me until my daughter was born. Fascinated by pink, attracted to red, intrigued by green.. colors are a very essential component of my little girl’s life. I was amazed how intrinsically she attributes her varied emotions to colors. Red is when she is in foul mood, yellow when feeling good, orange is funny and pink when happiest. Black and white are boring for the 6 year old, so they are never mentioned. There is no particular reasoning for her specifics… they just are. So along with crayons, dresses, shoes, furniture and other paraphernalia, we make sure the food is well colored too. Well, not one to use synthetic colors in our daily diet, we mothers usually satiate the child’s fancy in alternative ways. Nature is abundant, giving and generous. Team it up with a simple potato saute and you are so good to go. A dry potato saute used to be a big hit in my mom’s house. It still is. 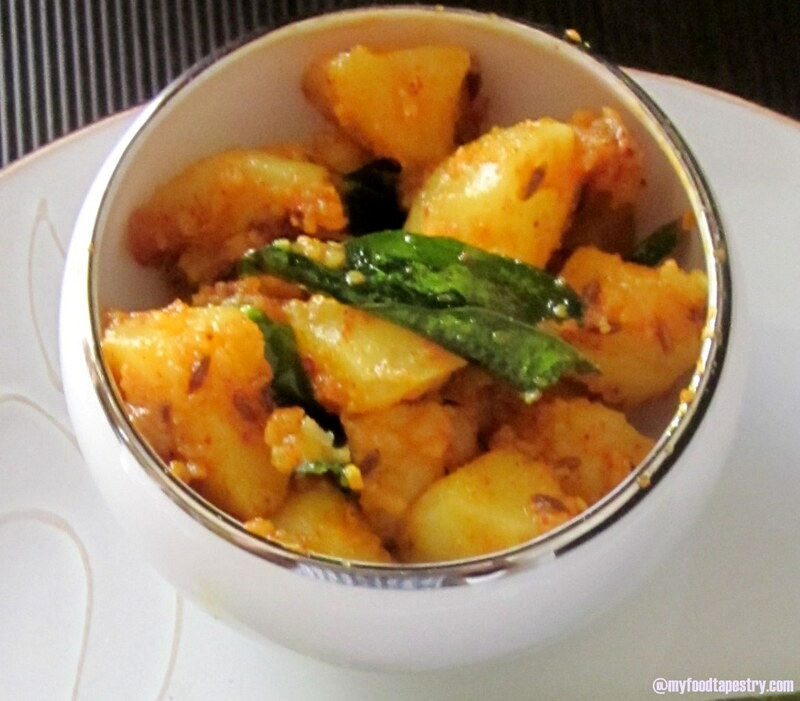 Mother makes it with just some simple spices, boiled potatoes and lime juice! I could never replicate it. Blanch spinach. Grind it using no water with green chilies, garlic, salt and sugar. The paste should be smooth and fine. Not coarse. Take the flour in a big mixing bowl, make a well in the center, add the spinach puree along with salt for the flour and carrom seeds. Knead into a soft pliable dough. Chances are you will not need water or anything else to get the flour together. 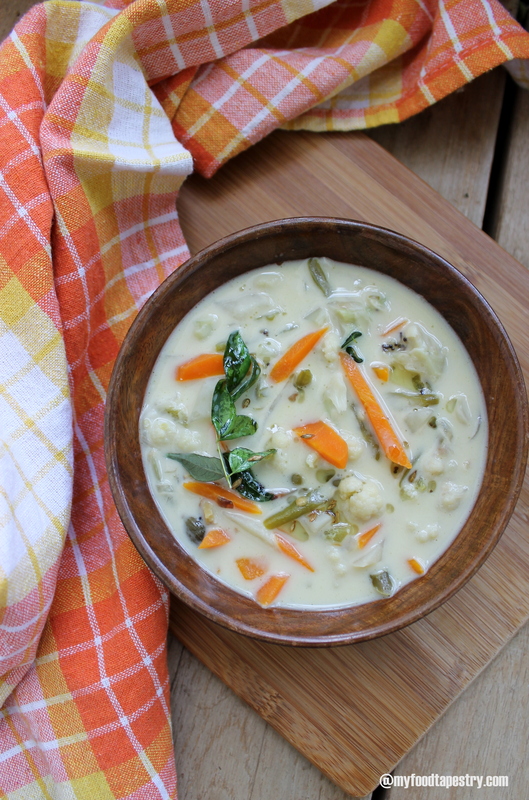 The puree will be enough, but just in case you do, try using spoonfuls of yoghurt or curds. Once done, knead well. Keep aside, covered for 30 minutes. Heat a flat griddle or tawa. Grab handfuls of the dough, roll them out into thin rounds. Place on hot tawa/griddle, and using very little oil/ghee/butter, roast from both sides. 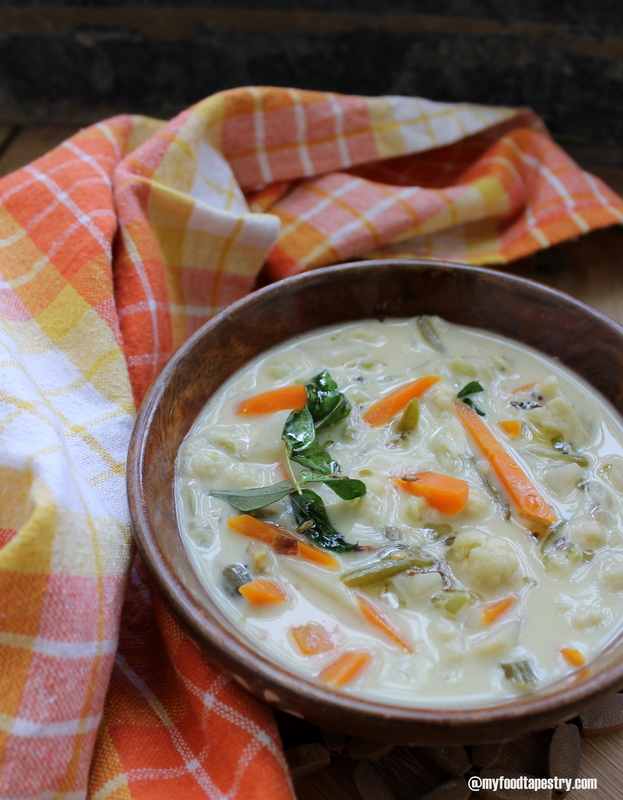 Serve with potato saute or caramelized onions or any vegetable curry and a bowl of yoghurt. 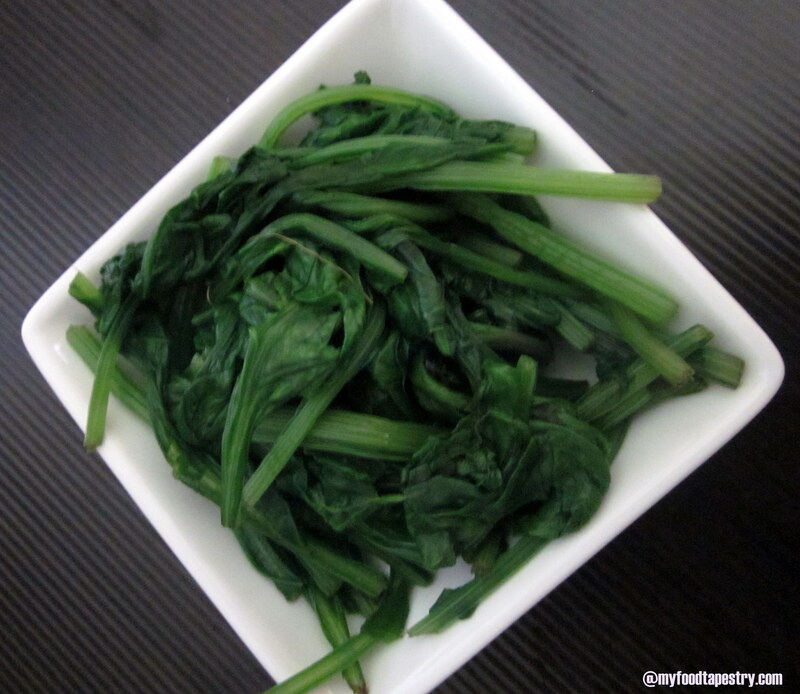 Spinach is best blanched in wilting the leaves in hot water for 3-4 minutes, then immediately running them in cold water. This retains the fabulous color. Sugar while grinding the blanched spinach helps in masking the slight bitterness of the green when grounded. 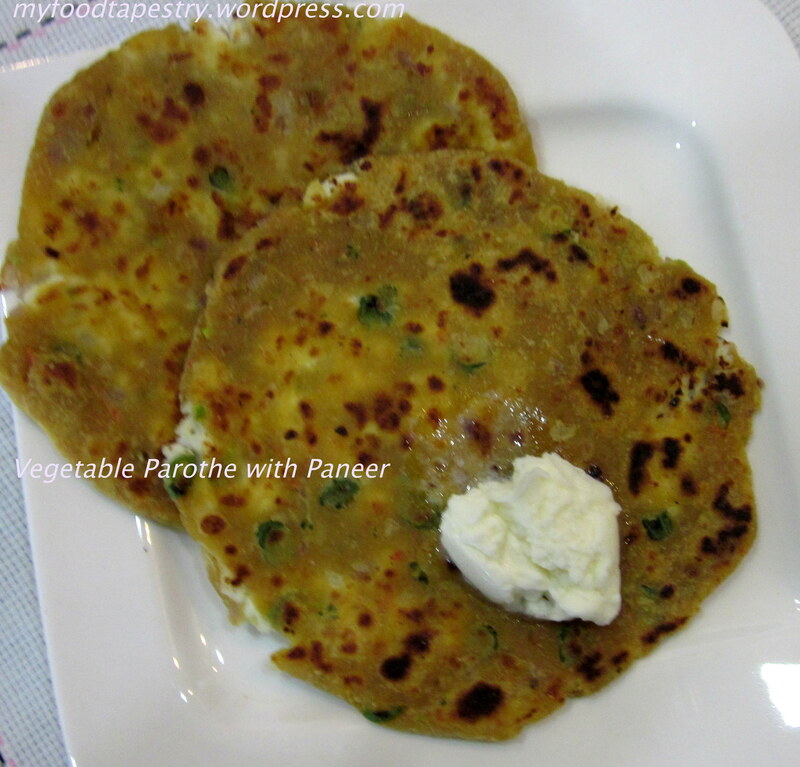 Curd/Yoghurt in your dough will yield soft melt in the mouth parathas. 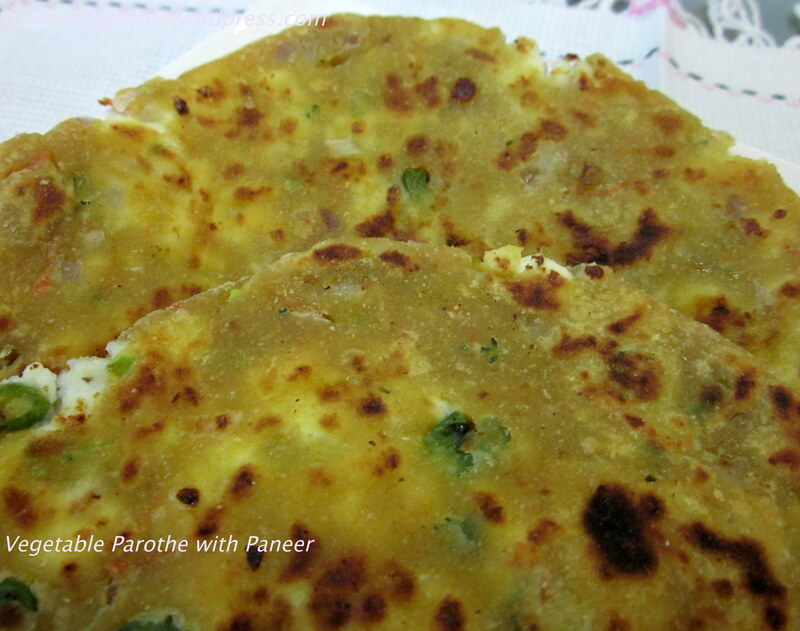 These parathas are ideal for lunch-boxes or as take aways. In a wok, heat a tbsp of oil( yes, a little more than required), splutter 1/4 tsp cumin seeds, add 1/4 tsp of asafoetida/hing, 3-4 curry leaves, 1 split green chili, a cup full of chopped boiled potatoes. Sprinkle 1/2 tsp turmeric powder, 1 tsp of coriander powder, 1 tsp of red chili powder(or as required), 1/2 tsp amchur powder(dry mango powder), 1/4 tsp garam masala. Mix well. Switch flame off. Garnish with chopped fresh coriander leaves. 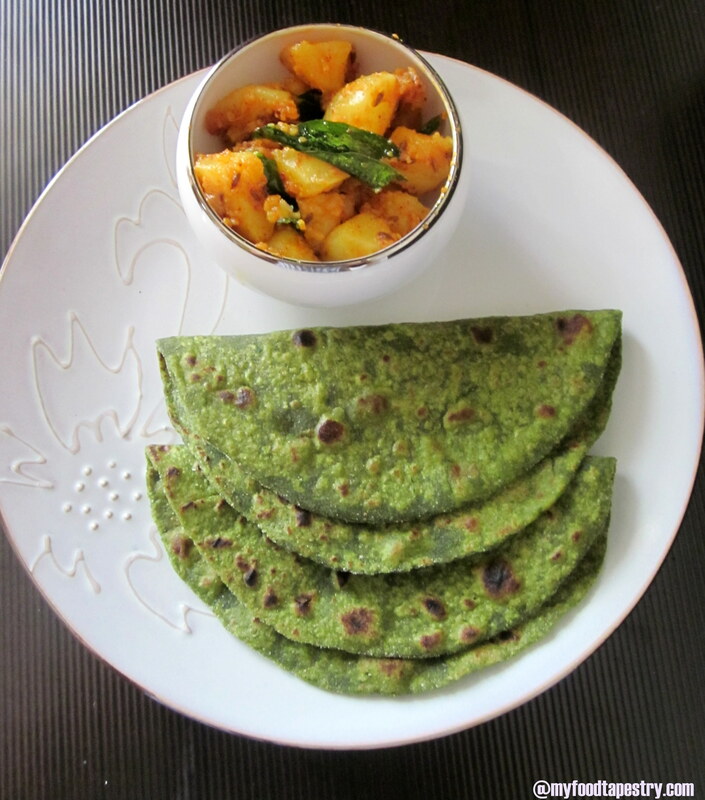 Serve with parathas or rice or even bread. Great when you are traveling or for lunch-boxes and tiffins. I don’t see Milee’s color enchantment ending anywhere soon, so till then we mothers will keep inventing, experimenting, exploring and trying. Most houses celebrate special days in a signature trademark way. Mine is no exception. Festivals, birthdays, poojas and various other special events brings back memories of a lot of noise – decorations – flowers and food! Glorious Food! I can almost see my mother fry pooris and make gorgeous halwa. And I almost hear her say ‘Kadai shubh mauke pe chadai jaati hai’, an auspicious day calls for putting that oil filled wok on fire. But then marriage happened and I got to see his side of conviviality. The festivities were an eye opener. I never imagined things to be so distinctly different in other houses… Naive? Yes. The celebrations in his house were such a dampner that my over enthusiastic spirit took a blow in the very first instant itself. His home housed 4 boys. Morbid, serious, sobre and very very health conscious boys. They never fried. Special days were as good as any other day. None of the noise or food or spirit that I grew up with. The husband always grumbles when I fry something. Especially Pooris. He dislikes them. It’s oily, Its deep fried, It’s not good for health… the complaints are many. “Its only once in a while” argument has no takers in my little fussy home. Daughter follows father’s footsteps, and declares that she is not too fond of all things ‘deep fried’. I’d like to believe she is just imitating him, but if only she was like me in some ways. Sigh. But dear readers, I do what I have to do. In spite of their protests, I fry. In an effort to make them respect every one’s wishes, likes-dislikes and in some hope of getting them to acquire the taste(Ha! As if its’s beer), pooris are made. Demanding to like what I like, doesn’t work. Coercion at gun point does. 😉 But I take such liberties just once in a blue moon, literally. 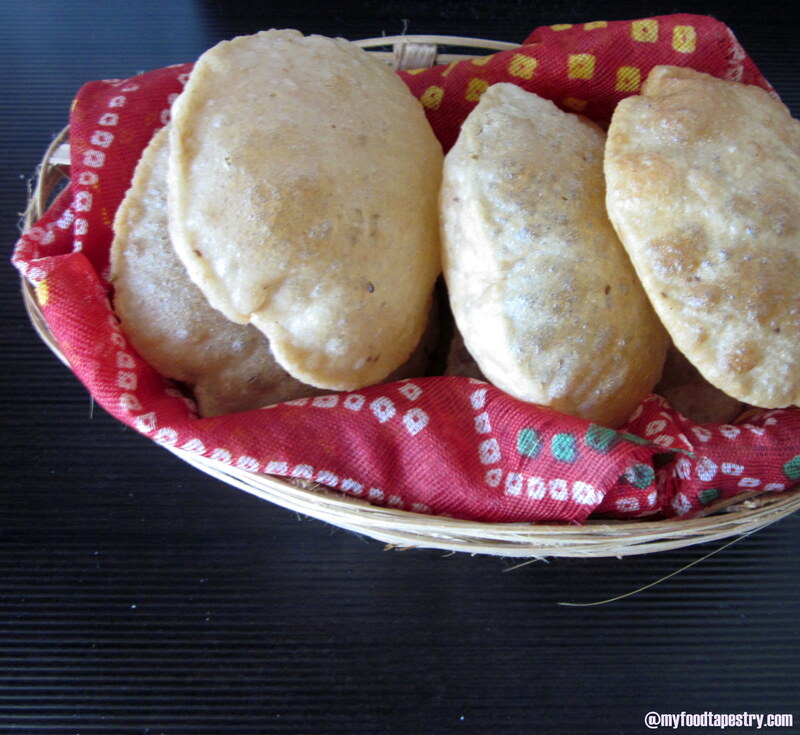 I can count the number of times I ventured into Poori making in all my 10 years of married life – 10 times. Really. So, usually-mostly-always I mess the making of these puffed breads. 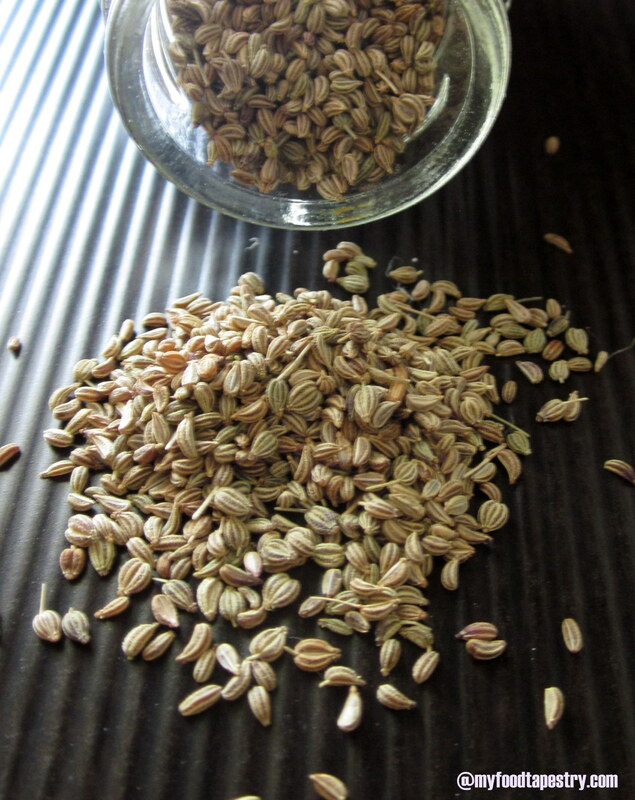 Adding carrom seeds or ajwain to the flour, enhances the flavor and digestive properties of the bread. This dried herb is the show stealer according to me. luke warm water, enough to bind. To the flour, add salt and carrom seeds. Using luke warm water, bind into a stiff firm dough. The dough should be soft enough to roll our without needing to dust it with flour. Using little oil, knead again. Cover and keep aside for 30 minutes. When ready to fry. Put an oil filled wok on heat. Grab walnut sized portions from the dough. Roll out into small flat rounds, around 2 to 2.5 inch diameter. Care not to make it too thin, else the pooris will not rise and puff. Now, the oil should not be smoking hot, just hot enough for the rounds to rise up when dropped in oil. If the oil is very hot, the pooris darken immediately. Using a slotted ladle, gently fry one side, then the other and remove on absorbent paper once done. Repeat with the other rounds. It looks simple, and once you are familiar with the technique it is a breeze. But I learnt this the hard way. I have messed it enough times to tell you the Do’s and Don’ts. 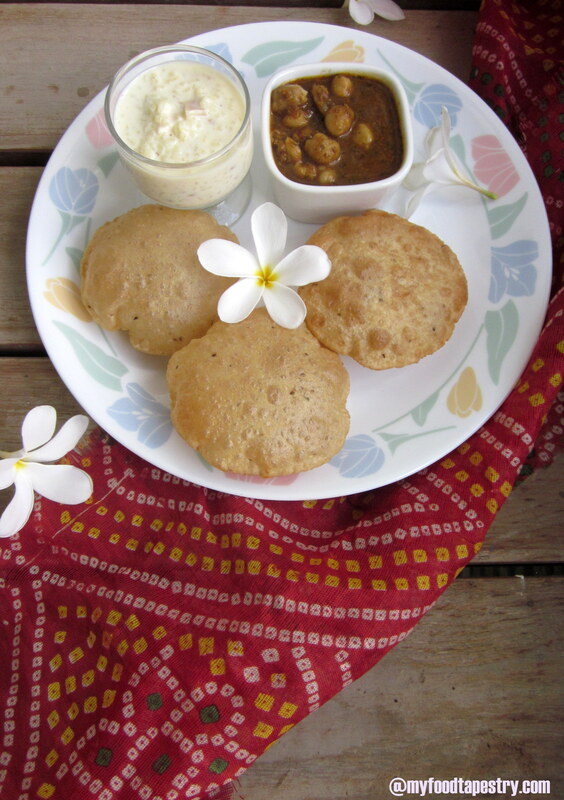 The dough should be stiff because if it is softer, you would need to use flour and when frying the pooris, the excess flour will settle in the oil and burn causing the pooris to get coated with black specks. The second reason is that the pooris would absorb more oil and become greasy. 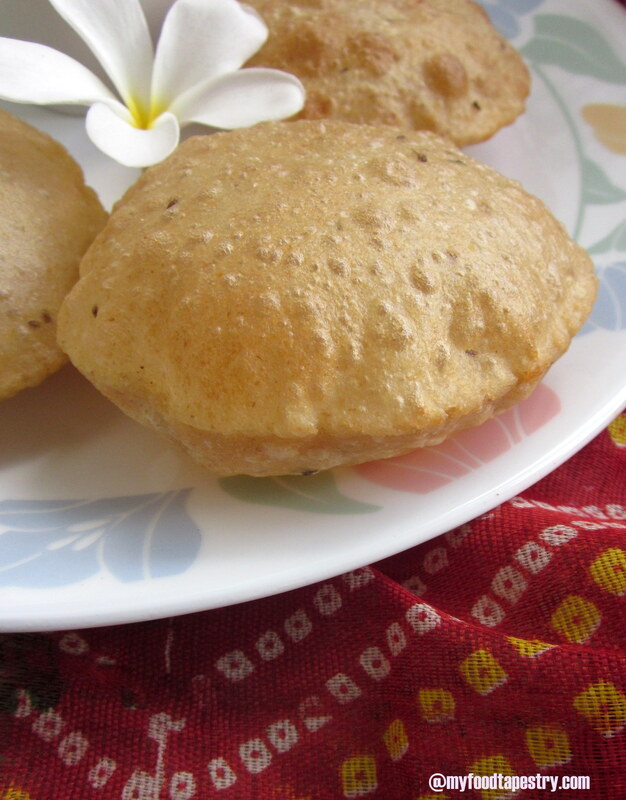 A good poori should barely show traces of oil on itself, after being deep-fried. If the oil is too hot the pooris will not puff up and become flat, crisp and very brown. If the oil is not hot enough the pooris will not puff up and will be very greasy. I pack Chole and puri in her lunch box. And its empty when she comes home. I’m pleased as a punch, only till I hear, “Sanjana loved your pooris Ma”. Sanjana? Huh? What did you eat? “Her bhindi roti”, pat comes the reply. 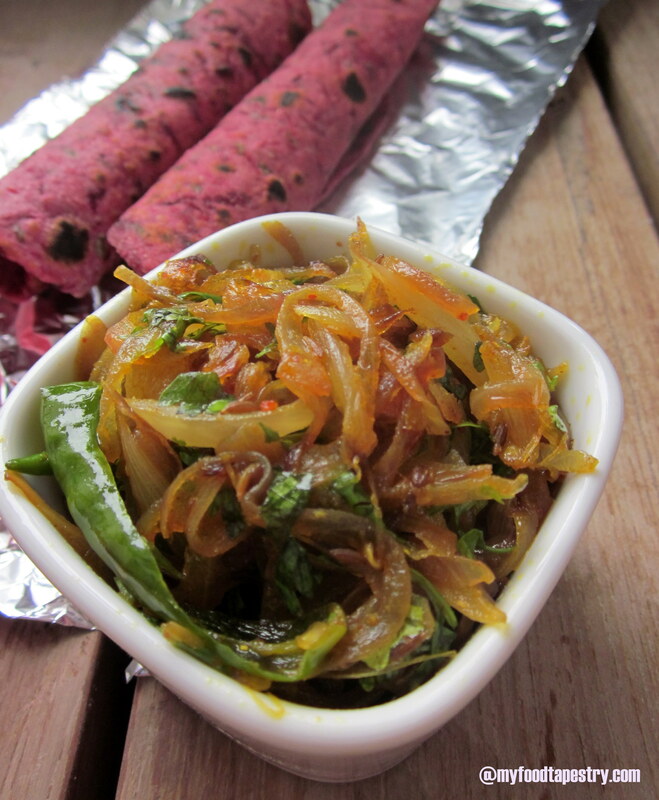 Caramelized Onions with some very nutritious beet parathas! 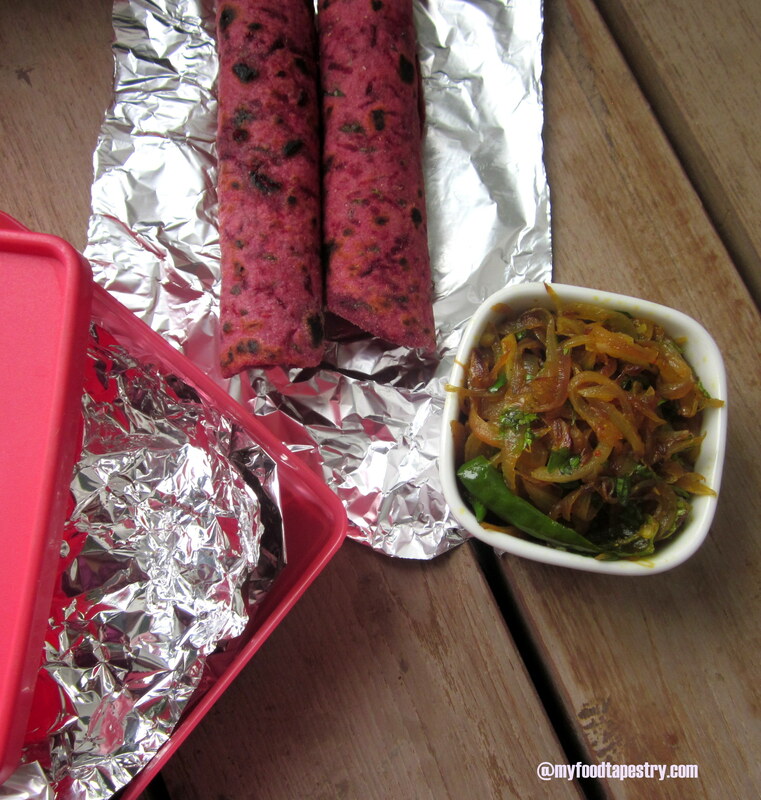 caramelized onions and pink beet parathas. Packing my child’s lunch box is an ordeal. Its not the work I loathe, but the myriad permutations and combinations of pabulum ravaging the morbid mind to lure my little girl. It’s a task – to think of something nutritious, something that will survive a closed box for a couple of hours, something that will invite the kid to pick, eat and relish. Milee enjoys the food she eats, but at her own terms. She likes it fresh, slightly warm and preferably savoury. And if her will prevails, something new everyday! 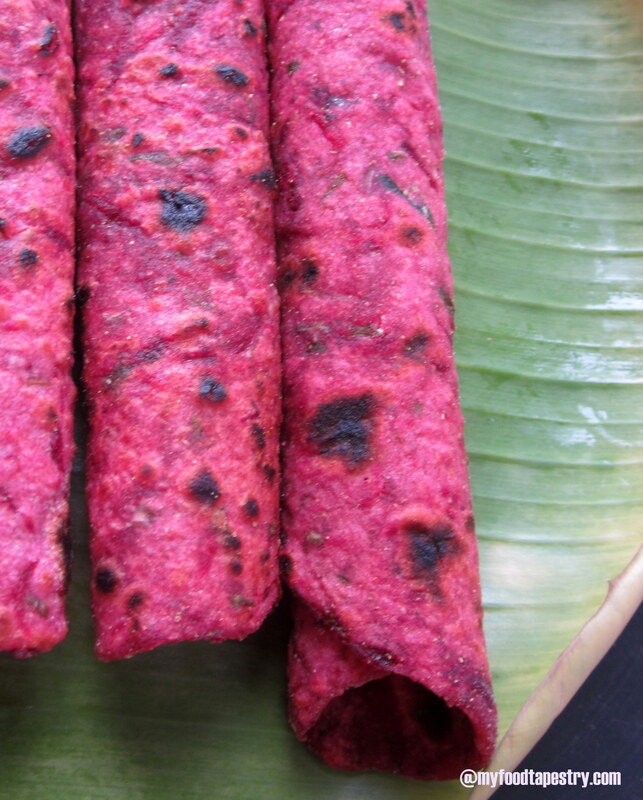 In an effort to appease her taste buds, tickle the pink fixation and boost her health food intake, we came up with this idea of combining caramelized onion sabzi with some pink beetroot parathas. Now who deosn’t like caramelized onions! For one it is so freakin easy. And not to forget ‘quick’ and most important, so ‘tasty!’. Mildly spiced with a green chili and garnished with loads of coriander leaves, this simple humble side dish with ghee and rice is my ultimate comfort food. Heat oil in a wok/kadai, crackle cumin seeds, add asafetida and sliced onions, green chilies, along with salt. When we add salt to any vegetable, it leaves water which helps in cooking quicker. On medium flame, saute the onions till slightly dark pink or light brown. Now they are slightly caramelized. At this stage, add the masalas. if you notice the quantity of masalas/spices is quite less. We want the dish to be mildly spiced so that the onion flavor is strong and fresh. Saute for an additional 2-3 minutes. Switch the flame off and garnish with coriander leaves. 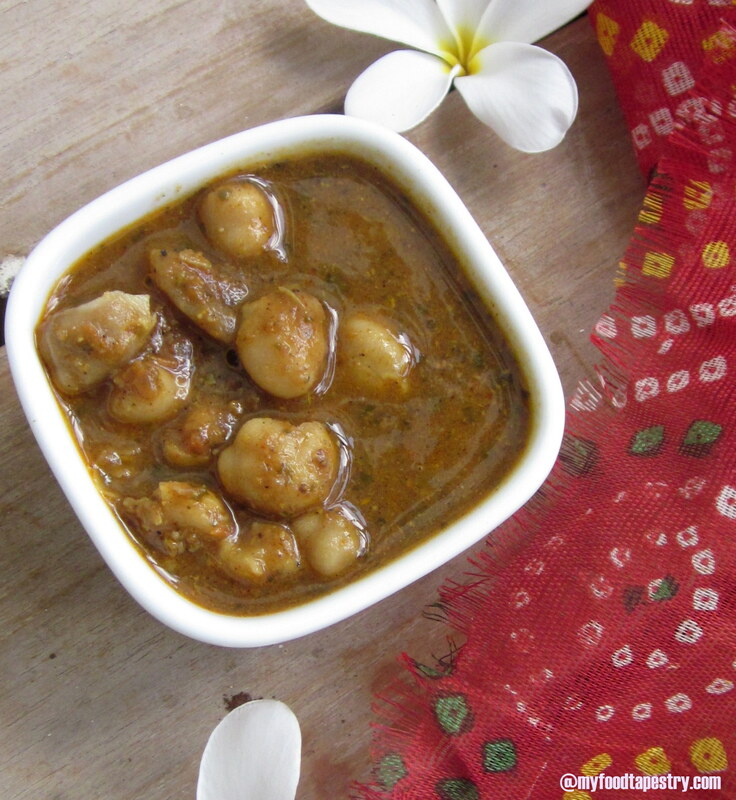 Serve with parathas, rotis, hot rice or even with bread. 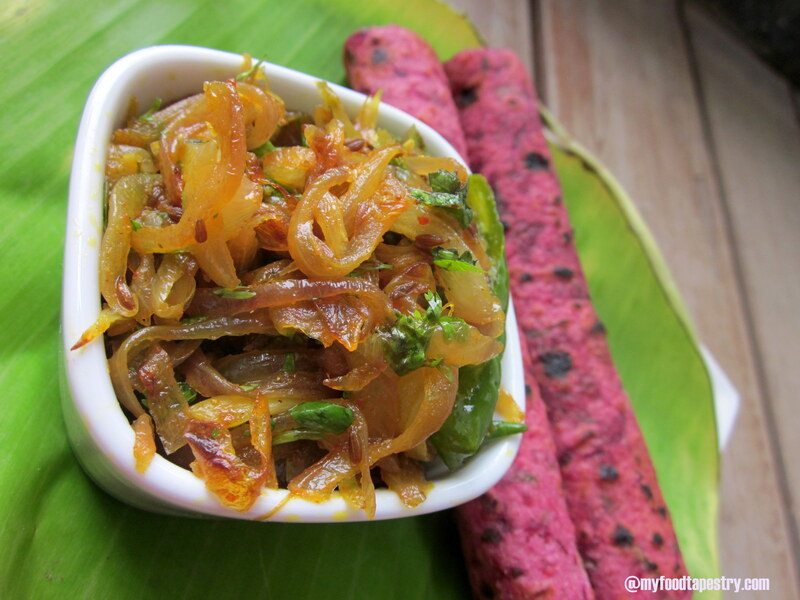 Note: Caramelized onions can also be used in wraps, savoury crepes/dosas and in sandwiches. Beet’s health benefits need not be eulogized. It’s common knowledge that the wonder veggie is packed with immense blessings. But, try making your little fuss pot eat this super vegetable with a smiley face. Not a smiling matter. And have you noticed? grumpy elder faces equals the strength of surly sour faced kids. Hence, we hide. We try to give the good, but away from the prying eyes of the acutely finicky consumer. It’s so simple to make this, you could even change the veggie according to your choice. Substitute the beet with a squash or some carrots or maybe broccoli. They are deceptively good and so simple to make. 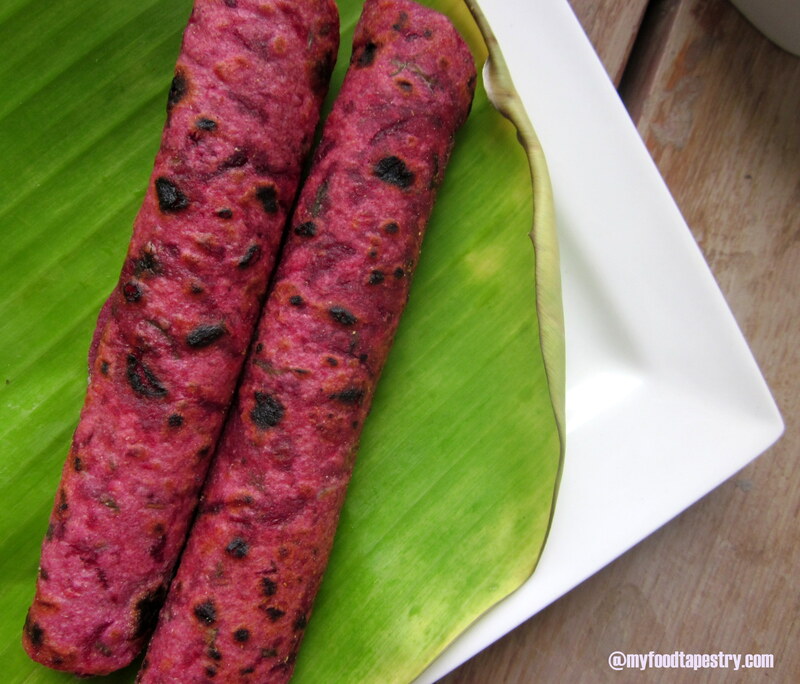 Combine the flour, grated beet, coriander, salt and cumin powder( and if using garlic paste, then that too). Mix well. Use little water to make a semi stiff, pliable dough. Cover with a wet muslin cloth and keep aside. After 10 minutes, heat a flat griddle/tawa. 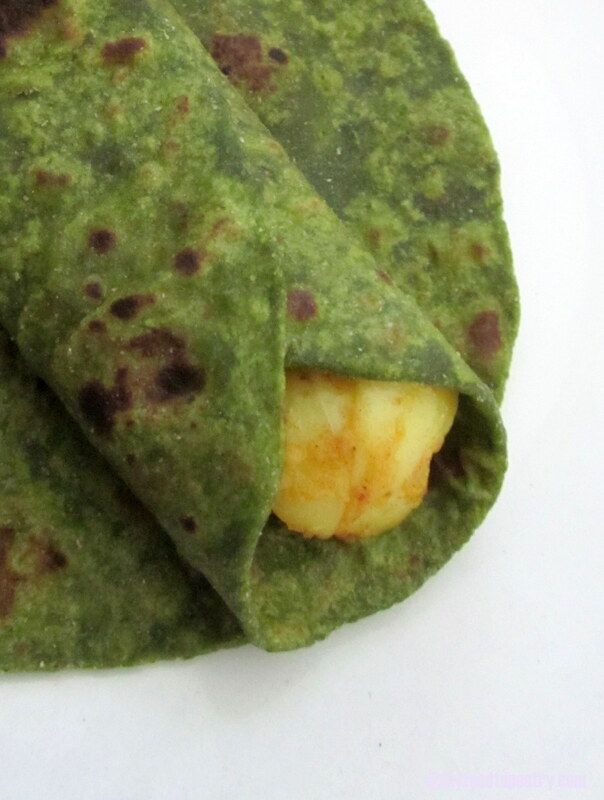 Grab handful of dough, using extra wheat flour, roll out into thin tortillas. Carefully, pick the rolled out dough. Transfer to the hot griddle, using little oil or ghee, cook from both sides on medium flame till they tiny brown dots appear. Serve with any raita, sabzi/vegetable side and pickle. 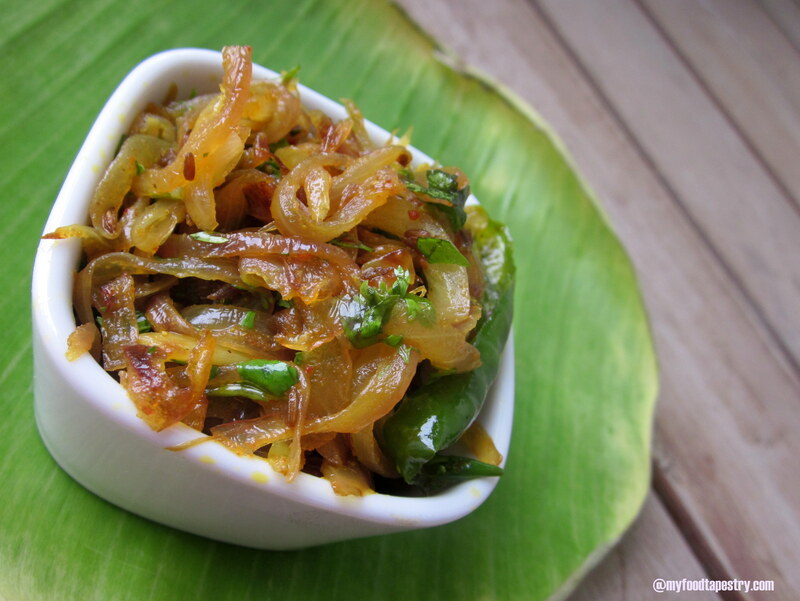 This Caramelized onion with green chili recipe is also my entry to the ‘Dish it Out‘ event hosted by Krithi’s Kitchen. 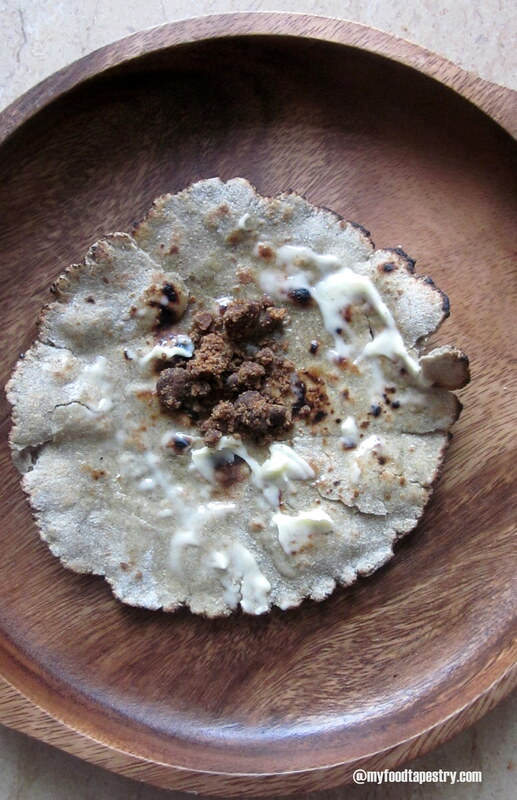 This super healthy nutritious Indian bread is a regular fare in my den. 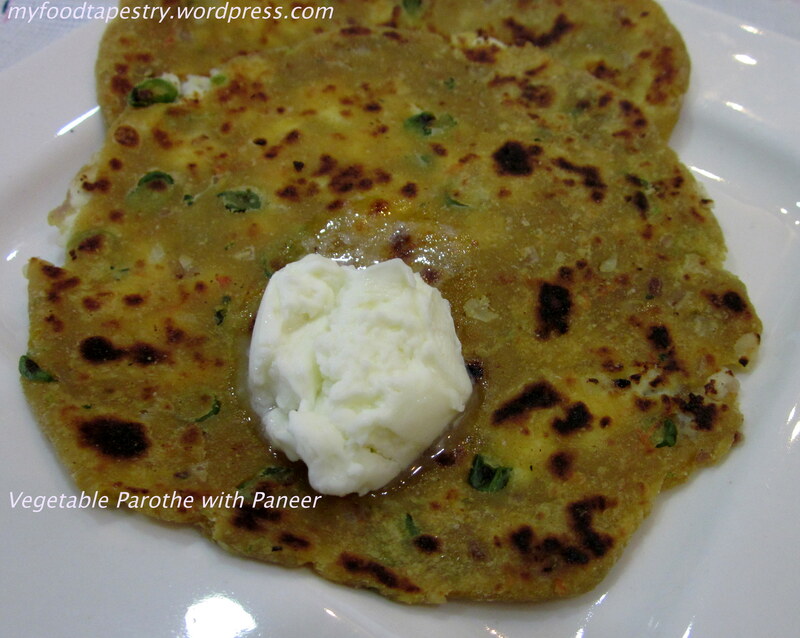 I indulgently serve copious amounts of white butter with this delicious power packed paratha. Whole wheat flour combined with a host of grated-minced fresh veggies and subtle spices, enhanced with a filling of Cottage cheese/ Paneer — doesnt get healthier than this?!! Does it. For picky kids, with bird like appetite, this is a good wholesome meal, where you can sneak in veggies that you want your kid to eat and not get into another food brawl. In a big mixing bowl, combine the grated minced veggies along flour, and salt, turmeric, carom seeds. Mix well and make a dough. 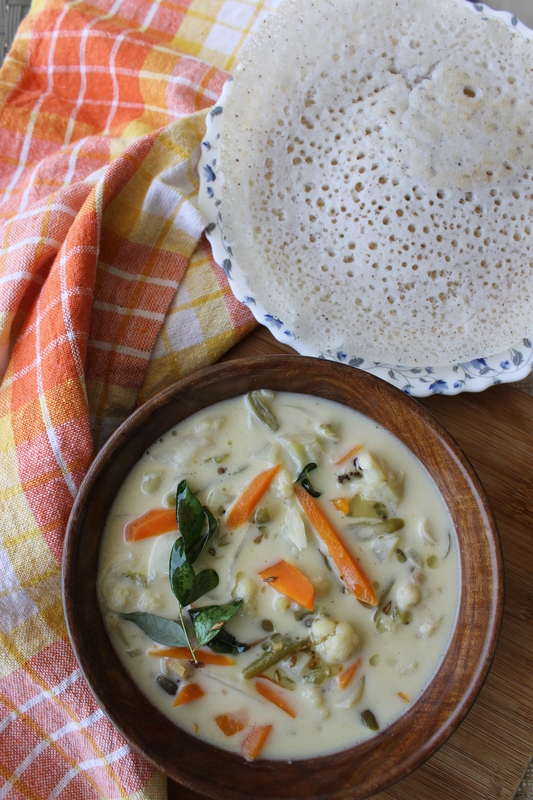 Usually, the salt secreted and the natural water content in the veggies is enough to bind the flour to the vegetables to make a dough, but if in any case, it refuses to bind, then add small table spoons of curd/yoghurt accordingly. The dough should be semi soft in texture. And if by chance it refuses to bind because it is too liquidy, then add more flour. 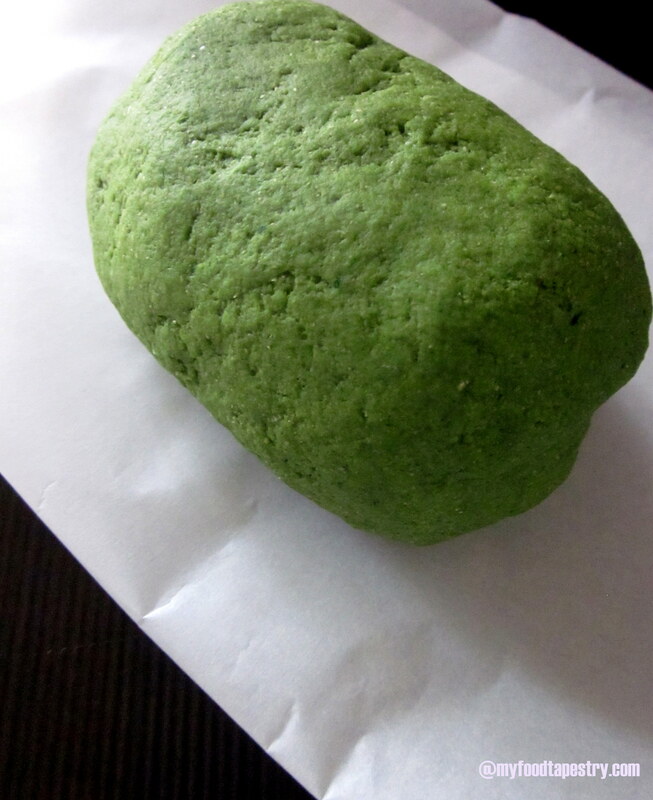 Now, this kind of dough need not rest, you can immediately roll them out. But what I like to do for best results is refrigerate the dough for an hour or two, and then roll them out into small rounds, fill with a tsp or two of crumbled paneer and then roll out again into bigger rounds( with the help of some flour). Now carefully, pick these and transfer to a hot tawa/griddle. Roast on both sides using little oil/ghee. Serve hot with white butter and bowl of curds. There!! A nutritious healthy meal, ideal for any time…. breakfast or lunch or dinner or in your lunch boxes! 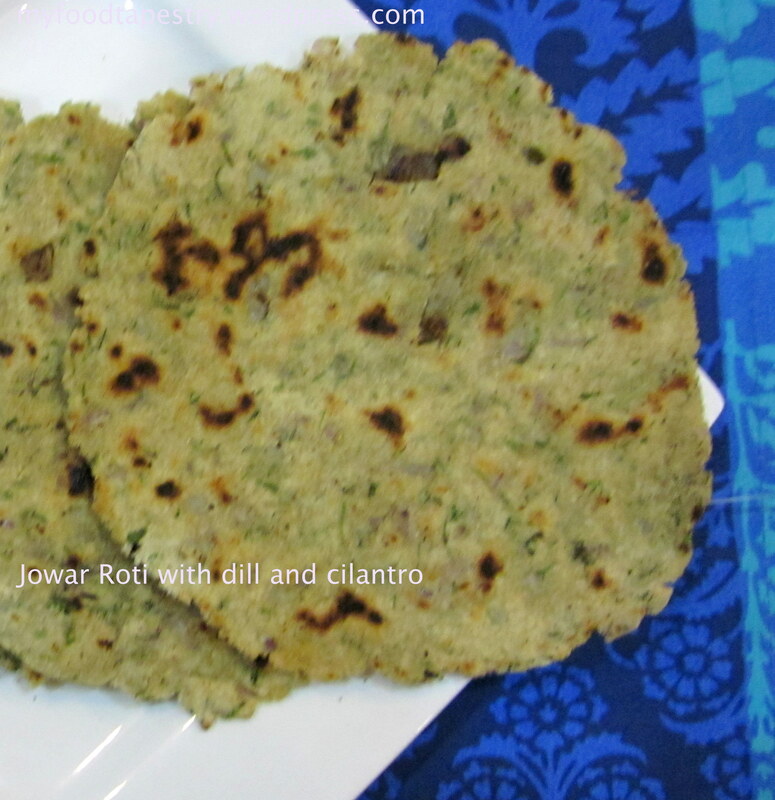 Jowar Bhakri is a traditional Maharashtrian recipe. It is a staple diet of people living in rural Maharashtra. 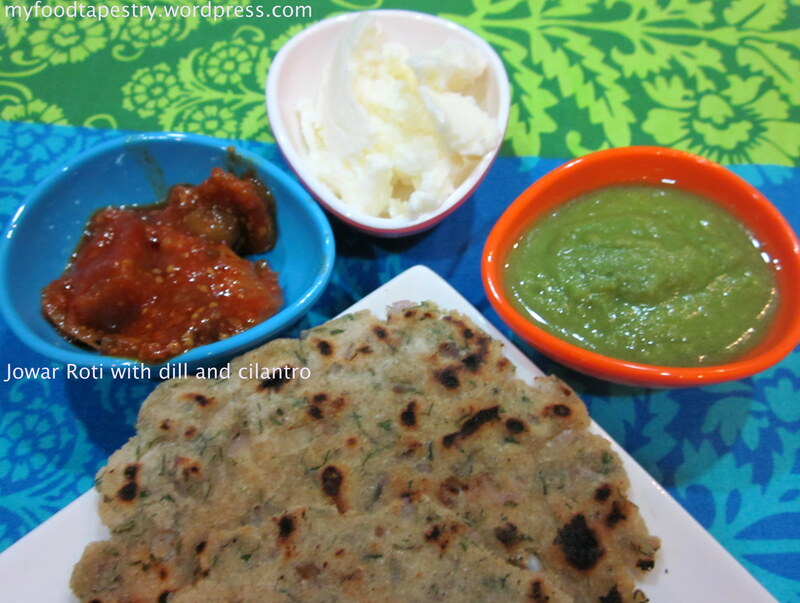 Bhakri is served with home-made white butter and garlic chutney. 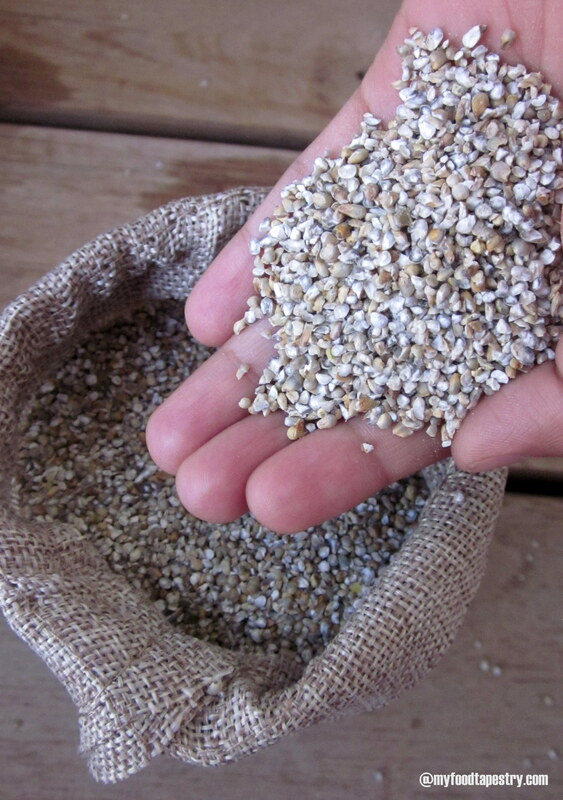 The benefits of jowar(Sorghum in English) are tremendous. First and foremost it is gluten free. Sorghum, which doesn’t have an inedible hull like some other grains, is commonly eaten with all its outer layers, thereby retaining the majority of its nutrients. Sorghum also is grown from traditional hybrid seeds and does not contain traits gained through biotechnology, making it nontransgenic (non-GMO). Jowar is high in antioxidants, which is believed to help lower the risk of cancer, diabetes, heart disease and some neurological diseases. In addition, the wax surrounding the sorghum grain contains compounds called policosanols, that may have a good impact on human cardiac health. I as usual have slightly changed the traditional recipe. Instead of using plain flour, I combined it with minced onions and coriander and dill. 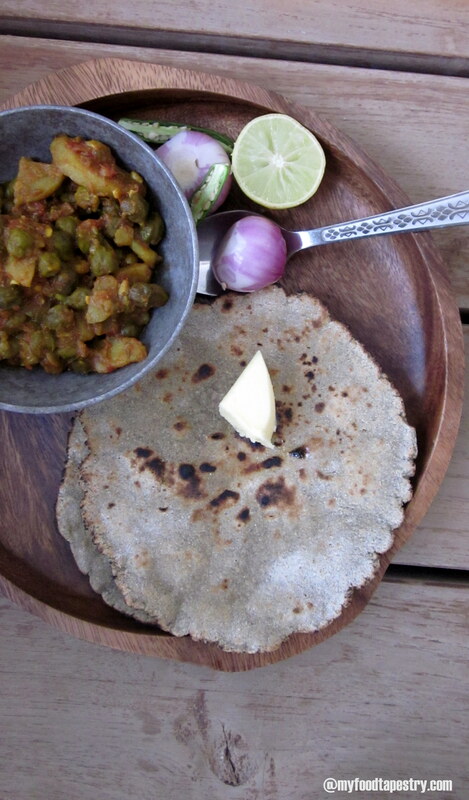 The additives impart such an amazing flavor to the bhakri, that it is indescribable. 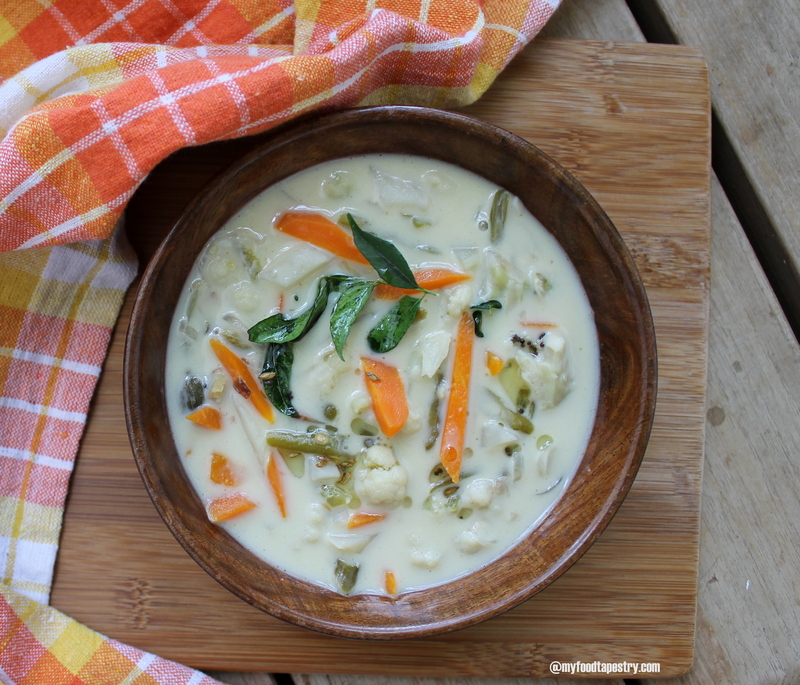 For me, it has become a weekly affair to make this super healthy dish for dinner. 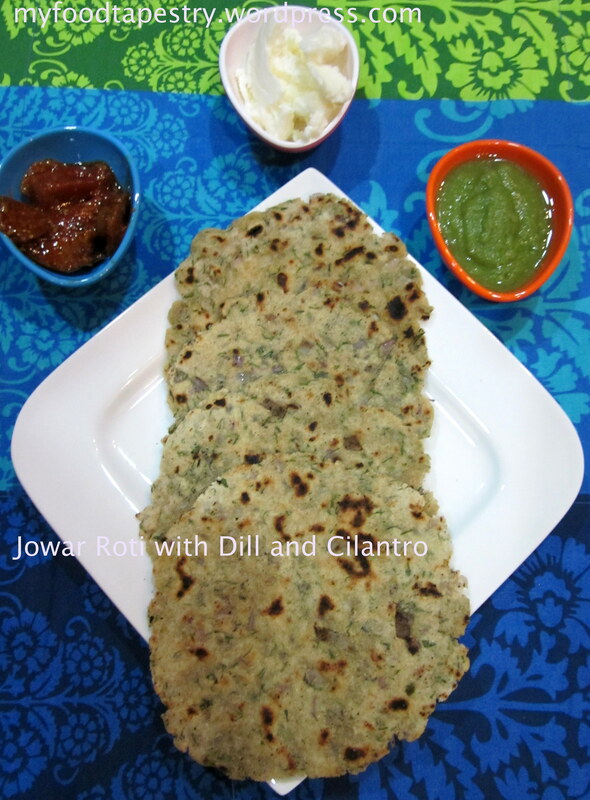 Combine the jowar flour, salt, minced onions, coriander and dill leaves. Make a soft dough using luke warm water. 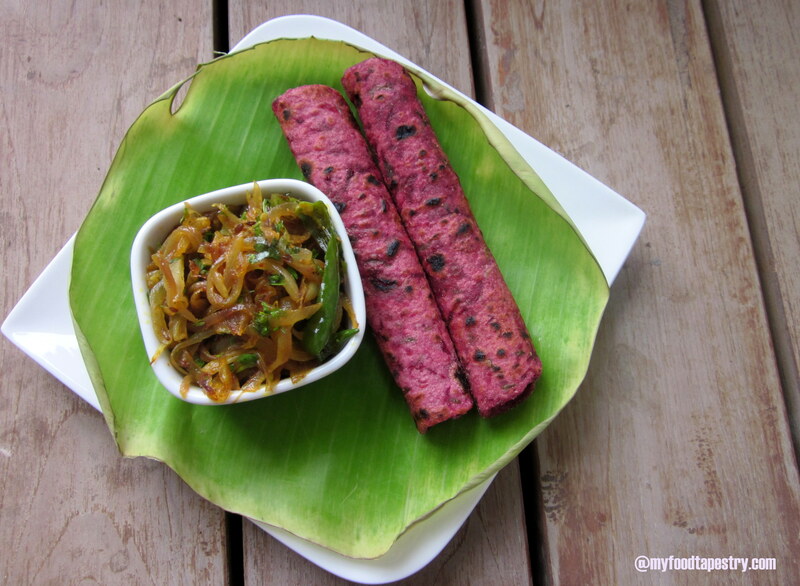 Now immediately, roll out rounds according to the size of the bhakri that you want to make. Take each round, using whole wheat flour, roll it out a little. You might find it difficult to spread further, in that case, use your fingers to press and make the bhakri a little bigger and rounder. Now using a flat ladle, pick the rolled bhakri carefully. Place it on a hot flat griddle. Using minimum amounts of ghee or oil, cook from both sides. Serve hot with home made white butter and any chutney or pickle of your choice. It can’t get nutritious than this. Really! Note: The downside is you cannot keep the dough for a long time, it tends to get moist making it really difficult to roll out the rotis. So, you start preparing the dough and making the bhakris, just 10 minutes before you serve. benefits of Dill: Dill leaves are supposed to contain anti-oxidant, disease preventing, and health promoting properties.This popular herb contains no cholesterol and low in calories. However, it contains many anti-oxidants, vitamins like niacin, pyridoxine, etc., and dietary fibers, which help to control blood cholesterol levels. You can skip the dill if you don’t like the medicinal taste of it and make the bhakris with just onions and coriander, it tastes good any which way.